I'd love to share what I know with you. From in-person multi-day retreats, to online courses, to books, instructions and more – I'm here to share what I know with you. A couple of times each year I throw open the doors of my island home and welcome kindred spirits into my studio. We explore color and art, and share stories, music, beach walks and laughs. We break bread and drink wine and eat healthful, yummy food that I lovingly prepare. I hope that someday you'll be the one knocking at my door! One-day workshops designed to give you as much information as I can! Live in the Seattle, Washington area? Then join me for fiber art and photography at the Kirkland Arts Center. Live further away? Stay tuned for workshops on the road. Yes, I also travel to teach, so let me know if you or your group would like to coordinate a creative workshop in your area. I've written lots of colorful books to inspire you. From pure color theory in really fun and easy nibbles, to guiding you through the how-to's of creating art. My hope is that you'll find loads of creative sparks as you turn the pages and that you'll dance along with me on a very colorful path. Coming soon! 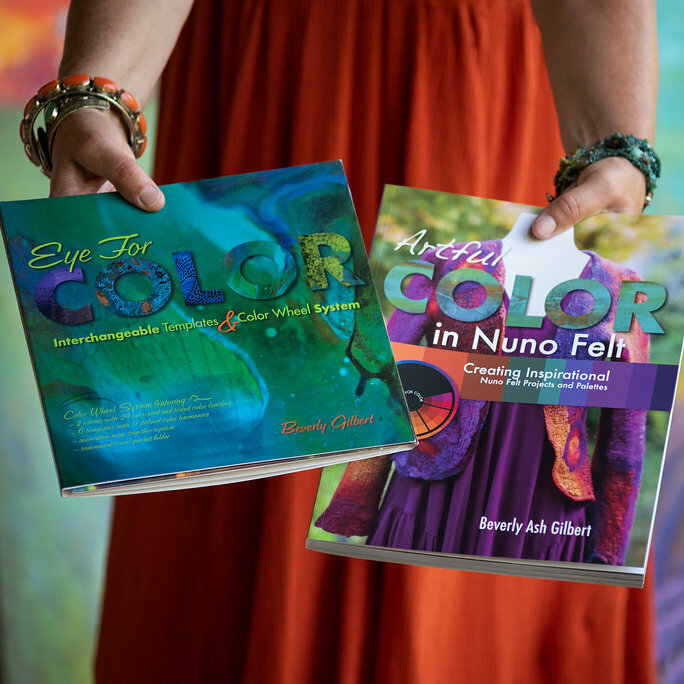 I am busy creating some online courses full of color and inspiration. When you join my mailing list (quick sign up is below), you'll be the first to find out when and what I'll be teaching! Hello Beaders! Learn to approach color as a painter does, only your palette is beads, and your paintings will be spectacular Freeform Beadweaving jewelry. I pack each set of instructions full of information to really get your creativity flowing. My housewarming gift to you – Receive 10% off coupon good for anything in my Shop. I promise to come into your inbox with positivity, color and joyfulness and of course, I respect your privacy and will never share your contact info with anyone.